Kaeser's portable air compressors are designed and built for rugged use and dependable performance. These portable air compressors provide a reliable source of compressed air for construction sites and other industry applications such as demolition, sand blasting, sprinkler irrigation, pavement breaking, general air tool use, and monument engraving. Rugged heavy-duty steel chassis construction means that any of the powerful units in Kaeser’s air compressors can stand up to years of regular use and remain strong and reliable. 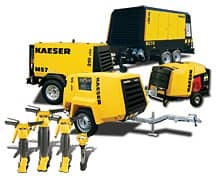 A wide range of tow behind Kaeser portable air compressor models and accessories are available to suit virtually any need, offering unsurpassed, rugged durability, ease of use, and low noise levels, making these portable units well suited for rental houses, repair trucks, and railroads.